A Big Week for People Overstating Their Opinions... Environment and Refugees Under Fire? This week, there have been two major snafus where officials in position of authority have made remarks that were unwisely chosen. Seeing this second example has promoted me to comment on both. I'll start with the one I saw today. The Jordan Times reported today that Andrew Whitley, the head of the New York UNRWA office, indicated that Palestinian refugees should give up on a right of return and the Arab countries should find places for them. UNRWA (the United Nations Relief and Works Agency for Palestine Refugees in the Near East) provides assistance, protection and advocacy for some 4.7 million registered Palestine refugees in Jordan, Lebanon, Syria and the occupied Palestinian territory, pending a solution to their plight. UNRWA is funded almost entirely by voluntary contributions from UN member states. Before moving to Jordan, I had no idea that the UN had an agency dedicated specifically to Palestinian Refugees. To further illustrate, Jordan is currently served by both UNRWA and the UNHCR (United Nations High Commission on Refugees, the UN Refugee Agency). The UNRWA deals with Palestinians registered with the UN as refugees. These are people who typically live in one of the acknowledged refugee camps, I believe there are 15. I blogged at Christmas time about my visit to one of the camps. It was a sobering experience. The UNHCR covers the Iraqi Refugees in Jordan. However, let's be clear. To be a refugee served by the UNRWA, you must meet specific criteria. As an example, El 3atal and his family have no relationship with UNRWA for all that they are refugees. Those Palestinians who came to Jordan and received citizenship cease falling under the auspices of direct support for the UNRWA, from what I understand. So, this agency is specifically for the Palestinians. You may recall I posted about the Baqa'a refugee camp near Amman and the impact it had on me on my very first trip to Jordan. Seeing the homes and shops with corrugated tin roofs held on by cinder block as a visceral reminder that they are only here temporarily and waiting to return home remains with me. For an official of UNRWA to say that the Palestinians need to give up on their ability to ever go home is to say that organization has no purpose, to my way of thinking. After all, the organization was created to provide services and advocacy for Palestinian refugees until their situation is resolved in accordance with international law. Did I miss where that has happened? Somehow I don't think so. The UNRWA was quick to say that these express Mr. Whitley's views, not those of the UNRWA. Frankly, if he didn't lose his job for saying something like this out of turn, he should have. I take the same very dim view of this as the recent brouhaha over the (former) Minister of the Environment's resignation after poorly conceived remarks. As a representative of your organization, you provide a public face. It appears that, like the Jordanian government, UNRWA needs to provide media training for its Directors. When you are speaking at a meeting of the National Council for U.S.-Arab Relations in your role as NY Director of the UNRWA, you don't get to have an opinion. If you do have an opinion, you keep it to yourself. So, I love to read. Given choice of 10 exciting things to do, I would pick up a book in a heartbeat. Generally, I read alot of romance novels in the year. An old English teacher called romance novels bubblegum for the mind. I can't disagree with the assumption. But, have no fear, I won't be recommending any formula fiction for this top ten reads. This year, through a group of friends, I've gotten into reading more meaty works. They aren't necessarily hard books, there's just more to them than the romance novels. It's been fun. So, I thought I'd share some of my favorites. Oh, and to give you a cope for the amount that I read, I ran out of romances before I left for the states. During October, I've read 8 real books. Some of them were quite long. I seem to average a book every 3.5 days (3/4 of the books have taken me 3 days, 1/4 have taken 5). Romance novels usually take me no more than 2 days... So, here's the list of things I'd recommend from my reads so far in 2010. Water for Elephants: This is an excellent book. I mentioned it in my previous post. The author wrote this novel in one month. Yep, 30 days and she wrote one of my favorite books in forever. As I said at the time, I never knew I wanted to read a book about the circus in the early 20th century... but I did. This is a great read, engaging story, and not difficult. The Book Thief: Another great book. This one, however, requires a shift of perspective that is challenging at first. It is written from the perspective of death, which takes some getting used to. On the other hand, death has a very dry wit, apparently. I'd recommend this for anyone who has a VERY firm grasp on English and enjoys having their assumptions challenged. The Twentieth Wife: I read this one this month. On loan from a friend, I read everything she had to offer, whether I thought I'd like it or not. This one was truly a gem. It is about a woman who marries a King. Very interesting the journey and her story. The Girl With the Dragon Tattoo: I loved this book. El 3atal found it hard to get into. He felt like the translator missed the boat in some areas and seems to have given up on it. For me, I found the story so compelling that I didn't even notice the errors, and trust me that's saying something. I also loved the 2 sequels to this one. Thanks SwedeBean for giving these to me to read. The Time Traveler's Wife: This is another perspective bending book. It is about a man who travels through time and his relationship with the woman he eventually marries. It's a strange book that transports you to odd places that you keep feeling like you've been before - because you have. It's an excellent read. The White Queen: Philippa Gregory has carved out a niche for herself with her novels about royalty in England of long ago. Her novel, the Other Boelyn Girl rocketed her into stardom. Each one of her novels takes on a different queen. I've found each of them engaging and they give you a feel for what life could have been like in their time. I very much enjoyed this book. It is one of my favorites among her work. The Glass Castle: This one was not one of my favorites. However, it was very well written. The abject poverty and growing up too fast theme didn't grab me. Perhaps there were home truths that I didn't want to feel... Some stories I just don't want to take so personally. Anne of Green Gables: I've been reading this one with the Beans and couldn't help myself. It's one of my favorites as a child. This is an excellent book about an orphan who finds a family, love, and a new life on Price Edward Island in Canada. I highly recommend this for all young girls. Can You Keep a Secret: I love, love, love this book. Rather than serious fiction, this is a lighthearted story about a young woman who blurts out all of her secrets to her seatmate on a plane in the middle of terrifying turbulence. It turns out, he's the owner of her company. In the spirit of full disclosure, I first read this book in 2005. However, when I find myself at loose ends or needing a pick-me-up book, I always come back to it. I've probably read it 1/2 dozen times by now. So there's my top ten read this year. Anyone care to add something to the list? Fair warning, those who add something will likely be expected to loan it to me ;). Get reading, Jordan! MommaBean throws down the gauntlet, are you up for the challenge? Ladies and gentlemen, come one, come all. November is National Novel Writing Month (NaNoWriMo to those in the know, which now includes you). I think that this a challenge that Jordan needs to take up. The state of reading in Jordan is dire. Let's make a mark by bumping up the stakes. MommaBean will host any writer living in Jordan who successfully completes the NaNoWriM0 challenge (writing at least 50,000 words during the month of November) to a fine dining experience. Yep, I'll provide the meal for anyone who manages to make this happen. Fundamentally, here's the thought behind NaNoWriMo, write a novel during the month of November. It doesn't have to be good, it just has to meet the required number of words. Personally, this is my first attempt. During the last year, I read one of the novels that came out of this month. Water for Elephants is an awesome book that tells a simple, yet elegant story. The idea that the author wrote in a month is intriguing. So, I'm giving it a go. I have no idea whether I'll be successful, but I'm going to get out there and do it. I urge you to join me! I came across this video through friends. I have to say that it brings up a number of emotions for me. These students at University of Michigan took part in a beautiful protest. They were silent throughout, just as the victims of the terrorist Israeli government are silent. Notice several of the students have Duck Tape on their mouths making the point even more powerfully. At a school where the administration believes it is appropriate to invite such "guests" to the campus, I am so proud that these young Americans have the strength of character and beliefs to stand up and be counted. The fact that a school in Michigan with a huge Arab population would bring them to campus is criminal. Good for those who stood up and were counted! So, as the voluminous campaign posters have gone up, I've been watching with interest. The candidate pool is at the same time both hauntingly familiar and strikingly new. After all, Abu Shawareb (ala Dave's post at the last election) is back again. But, Mr. Layalina and Mr. Sell-his-grandmother aren't. I have noticed that just today a new poster went up for a fellow sporting stubble (and a questionable hairstyle that is almost channeling Donald Trump). Haven't seen him before. Or the guy who looks like he's trying out his first-ever smile. But, so far my favorite election moment (if 3 days can be considered a moment) is when I first read the posters for Reem Badran. What? She's the brown hair candidate? Hunh? You see her slogan is "without slogans", which with my questionable Arabic reading skills and a font that makes the d look like an r mis-translated into broon sha3araat (brown hair was all I could come up with). I actually almost would prefer that. That would really crack me up... Hi, I'm the brown hair candidate. After all, the reasons people vote for a candidate here often seem almost that silly to me. Not sure for whom I'll vote, but the brown hair party is leading so far ;). I saw an article about a week ago and came another one on the same topic this morning. The tale is one right out of every conspiracy novel or film made... A guy goes to get his oil changed and the tech notices an out-of-place wire. They discover a GPS tracking device attached to his car. When he posts a picture of it on-line to find out what it is, the FBI comes knocking wanting its device back... Yikes! This Arab American fellow clearly has drawn the attention of the authorities, apparently mostly because his father was well-known and he sends money home. It does make you wonder how many more of these are out there. In the earlier article it talked about the fact that this device isn't even very state-of-the-art. I will be interested to see what tactics his lawyer uses to fight this. It seems that the law on this one is still being written. Some courts have determined that GPS tracking devices require a search warrant as they go beyond a simple tail on a single trip. Personally, that argument makes sense to me. As the Washington DC judge said, it is unlikely anyone would actually spend the time following movements so closely for an entire month. That got me thinking about stalkers. They're about the only ones who do, right? So maybe they should sue for stalking? Take out a TRO (Temporary Restraining Order) to keep them backed off? ButterBean put this question to me the other day after ballet practice. Strangely, the moms had just had a conversation about an article one had read on just that topic. The question flew at me from out of the blue. I asked ButterBean where she heard about bullying? She seemed very reluctant to answer. It got me worried. I expect I reacted with my mommy-worry rather than calm and rational mode. Honestly I was surprised she even knew the word. In the end, it led to a very productive conversation about bullying. It's something that I've had on my mind since my kids started school in Jordan. I expect it would have been on my mind in the US as well. But, kids in Jordan are rougher. The girls have a precocious approach to picking at each other. And, they're MUCH more physical. So, I worry for ButterBean. 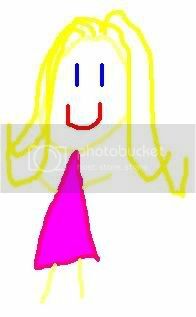 She's so sweet and often will give up something she wants to a classmate who is not even a close friend because they also want whatever it is she's gotten (bracelet in a particular color,etc.). We've had to have many conversations about protecting herself and not giving up something she loves. And she's shed tears over this. So, naturally when ButterBean brought up bullying, I was worried. After some conversation (not in the car), we discovered that this came from a book that she had gotten from the library. I have a sense there's some trigger I'm not in the know on, but... This week she picked a book in Arabic on bullying for her weekly story to read and answer questions. This continuing need to talk about bullying makes me think that she's trying to process it in some way. My guess is that it doesn't involve her directly. In fact, knowing her class, I'd bet it's outside her class. But it does have me wondering. It got me thinking. Then, today I saw a blog post from a woman to her daughter about bullying. She posted this in the wake of an NYU student killing himself as the result of on-line bullying. This is a trend I can't relate to. When I was in college, our very forward college had e-mail. Period. Not fancy e-mail, not the Internet. We had e-mail. So, cyberbullying is outside of my realm of experience. Regardless, bullying is bullying. However, the insight that gives is interesting... and frightening. The idea that because Islam says something that he perceives to be about empathy, he doesn't need to teach his kids to be empathetic, well I understand many problems better. Every religion likely holds values that, if followed perfectly, would lead to empathetic followers. And yet, we are all human. None of us, as far I know, are perfect. And frankly, the only way our children are raised with our religious values is if we teach them. We use discipline and gentle correction, loving guidance and teaching points. Without them, our children will not hold our values. In the best case, they'll hold no values. In the worst case, they'll hold the world's values. It's funny that when trying to translate the word, the parents all wanted to use different words for the concept of empathy. The one most of them thought of was actually sympathy. This is a common mistake. The difference, though, is vast. Sympathy is feeling FOR someone. When something bad happens, you are sad for your friend. Empathy is feeling WITH them. When something bad happens, your heart hurts with them. These are not at all the same thing. Clearly I don't talk to the Beans about empathy in those words. They aren't meaningful to a young child. What we do talk about is putting yourself in someone else's shoes. In a VERY simple example, we were walking down the street one day a month or so ago and someone with a physical handicap went by. One of the Beans was pointedly staring at them. We stopped short immediately. I explained to them that staring at someone is unacceptable. It is terribly rude. They asked why. I simply said to them, well you are blond and fair, how do you feel when people stare at you? Their answer, a little funny, kind of sad, not good. So I asked them, do you want to make that little boy feel bad like that? It was not the first time we talked about empathy. It won't be the last by any stretch of the imagination. Yet each teachable moment sets more firmly in their minds, attitudes, and behaviors what our values are. You can call them Christian values, you can call them human values. By any name, they are learning the values that we believe in. We believe in the dignity of humans. We believe in the rightness of respect. We believe in considering others before yourself. And if, by ButterBean shocking me with her talk of bullies, we can solidify that teaching even more, I'm thrilled. I submit to each of the parents out there that you understand your values and make sure that you are actively teaching them to your children. Make sure that you are surrounding them with adult figures who support that teaching. If their school is one of the many schools I've been hearing about recently that claim to have superior Islamic deen teaching but have teachers that hit children, complain and change that system. I assure you that if you think your children will learn that humans deserve dignity and respect by being hit by someone given authority over them... you are deluding yourself. If you don't yet have children, I submit to you to carefully consider what values you want to instill. Once the child is here is rather late to spend time thinking. You'll be so tired you won't be able to think. And know that each adult that you willingly place in your child's life is teaching them about YOUR values. Take that responsibility seriously. You are the one who determines the values they are instilled with. Man has lauded water perhaps since the beginning of time. Nothing in this world is more flexible and yielding than water. Yet then it attacks the firm and the strong, none can withstand it, because they have no way to withstand it." All the waters run to the sea and yet the sea is not full, and from the place where they began, thither they return again. When the well is dry, we know the value of water. The marsh, to him who enters it in a receptive mood, holds, besides mosquitoes and stagnation, melody, the mystery of unknown waters, and the sweetness of Nature undisturbed by man. Water has no taste, no color, no odor; it cannot be defined, art relished while ever mysterious. Not necessary to life, but rather life itself. It fills us with a gratification that exceeds the delight of the senses. When a child is locked in the bathroom with water running and says he's doing nothing but the dog is barking, call 911. Man is a complex being; he makes deserts bloom and lakes die. Sitting in one of the world's most water-poor countries where people use water as if they'd never heard the word drought, this year's Blog Action Day about water is especially meaningful. It is up to each of us to find ways to reduce, reuse, and recycle. In Jordan, water is perhaps our biggest place to make a difference. Let's all spend some time making water conservation and reuse part of our routine. And, on the bright side, it'll save money too! For more information on Blog Action Day and how you can help bring clean water to the world, check out this website. Am I the ONLY one even thinking about identity theft?! Seriously now. I have been working on my election ballot for the US mid-term elections. I'm aware I'm bucking a trend (or several). Mid-term elections like this one typically see voter turn-out between 30-40% of the US population. So, the idea that I am voting in a mid-term election from Jordan is extraordinary. On this ballot from my state in the US (one of the few that won't allow expedited mailing), you have to provide an affidavit (swearing basically) that it is your ballot and you've voted and witnessed by two adults (this is a positive step from the states that used to make you get it notarized... a practice that has been disallowed). Now, on this affidavit, which is printed directly on the envelope for mailing, it requires your name, address, signature, and date of birth. Really?! Basically, the only thing you haven't asked for is my social security number. Shall I place that on the outside of an envelope proceeding unsecured through the US (and, as an absentee ballot, likely foreign) postal system? I mean, what are they thinking? So, first thing many people will want to argue is that Jordanians are not shorter than Americans. If there were actually growth charts here, I'd be happy to quote them. Instead, I have to use my anecdotal evidence based on the Beans. So, let's talk about the Beans. I began to notice this short phenomenon with ButterBean. ButterBean takes after me. She has the petite genes. When she was under a year old, our pediatrician expressed serious concerns that she was so small. He looked at me and at El 3atal and thought she should be bigger. I went home, got my baby book information, and brought it in. She was WAY bigger than me at her age which allayed his concerns. Even so, on today's growth charts, ButterBean consistently measures in the 10th percentile. That means that 90% of kids her age in the US would be bigger than her. That's right, 90%! So, by that measure in each 10 kids in the class, 9 would be taller than she is in the US. By that measure, I expect her, like me, to be the wee-est one in her class. So, I ask you... in Jordan is she the smallest? Not at all. Not by a LONG shot. In fact, at last year's class performance Teta Bean and I discussed the fact that she is 50th percentile. She's in the middle, half taller, half shorter. She's just plain average in height. So, I got to thinking, well maybe she just jumped out of that 10th %ile bracket on the charts. I came home, measured her and plotted it. Nope, she's still 10th %ile in the US. But 10th in the US is 50th here. Okay, now you're thinking that's just one data point. No worries, I have 2 more. JuniorBean is also in the 10th percentile for his age on US growth charts. He looks like ButterBean and is small. But, happily (for me and for him), he's also not the smallest in his class. He's not even one of the smallest 2 or 3. He's not quite average, but he's getting there after a growth spurt during the summer. My final data point is JujuBean who is 75th percentile in height in the US. Yep, she takes after El 3atal's family and got the tall genes. In the US, she'd be tall, but 25% of the class would be taller. So, in that mythical class of 10, she'd have 2.5 girls taller than her. And in Jordan? She's an Amazon. When put next to her best friend, there is literally a head's worth of difference. She towers over the majority of her classmates. This year, she got a new classmate who is taller... and apparently supposed to be a third grader. In fact, JujuBean is average for ButterBean's third grade class. And in the US, she wouldn't be the tallest. Not at all. Basically, the article on BabyCenter explains how the human growth hormone experiences its most intense release "shortly after the beginning of deep sleep." Without enough sleep, kids may experience slowed or stunted growth... Production of the growth hormone can even be disrupted without enough sleep. So, how much is enough? KG2 kids should be getting 10 to 12 1/2 hours of sleep per night! So, the family that eats dinner at 8 and puts the kids to bed at 9 or 10... your child should be sleeping until 7 or 8 am. If they are on the low end of the sleep needs scale. And if they fall right asleep. That's not 10-12 hours of "lights out", that's 10-12 hours of SLEEP. So is height the only thing that is affected by too little sleep? Nope. The article mentions that it can affect heart and lung strength and immune system function (yep, they may get sick more). Sleep-deprived kids may overeat and show preference for high-calorie carbs (chips and cookies anyone?). And the lack of sleep hurts their ability to break down the insulin leading to Type 2 Diabetes. And that's just the pure physical impact. They also experience decreased motor skills, diminished concentration, and poor judgment leading to accidents, behavioral issue, and performance issues. And for those who think that afternoon naps will make up for it, remember that the growth hormone is released after the beginning of DEEP sleep, not light afternoon napping. The moral of my story is, make your bedtime earlier in order to get taller kids! I mean, the Beans may go back to being short, but at least they'll have fewer behavior related distractions in the classroom ;). During our vacation in the US this summer, I noticed something striking. For those of you who may be unaware, Alabama is not a rich state... not at all. In fact, it's ranked number 46 (out of 50) for median household income. Most of its income is agricultural and, in the broader scheme of the US, it's one of those much overlooked states. As a result, the state treasury isn't flush with money from large companies and huge taxation opportunities. Well, this visit I noticed something VERY interesting. Just below, you will find the standard Alabama license plate. However, I saw very few of them. What I saw instead were specialty plates. These plates are also called vanity plates. Originally, they looked like regular license plates, but had special sayings on them. A vanity plate was immortalized on Seinfeld when the proctologist (doctor of the yucky intestines) had a plate that was *ssman. 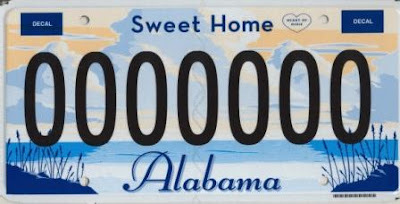 However, in its endless quest for additional revenue streams, Alabama has introduced new lines of specialty plates. They are more like "cause" plates. 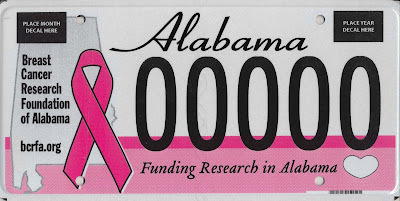 For instance, here is a "supporting breast cancer research" plate. The draw of these plates is that part of the proceeds goes to the organization. In fact, the first iteration of these included special plates for public and private colleges and universities. Back then maybe 10% of the population had special plates. This trip, it seemed like at least 70% did. And, I got to thinking. Now, I know that the EU paid for the new Jordanian license plate schema. And, herein lies the challenge. Those Europeans have their own little box. They have ideas and think they're the only good ones (it seems like there's another group that does that... oh yes, we Americans, teehee). So, Jordan ended up with European style ugly, ugly, ugly license plates. And, they missed out on an amazing revenue generation opportunity. Imagine with me a Jordan where each family could design its own license plate. Members of the family could pay a premium price to have this plate. I'm not talking auction them off for 10000 dinars. I'm talking, pay an additional 75JDs for this special plate. In Alabama, most of these plates are $50 extra per year. Since the EU schema planned for 10 million cars (let's not talk about where those 10 m would park or drive, but...), imagine the revenue if even 50% had specialty plates. Imagine the King Hussein Cancer Center's boon if they could get people to pay 100JDs and the center gets that extra 25... Imagine that world... Jordan could do away with several of its more arcane taxes by having such an offering... I'm sure of it. And, as seen by the Alabama license plates, the opportunities are endless. For those who'd like to see what I'm talking about, here is a list of all the license plates and their fees. And here are pictures of the non-collegiate plates and here are the collegiate plates. So, I submit to you, Jordan missed an opportunity once to look around the world and see how things are done world-wide. Hopefully the next time found-money comes calling, they will think more about other options as well, instead of accepting the first plain ugly license plate on offer, teehee. What lessons are we teaching our children? This summer in America was really a huge boon for the entire Bean family. With the start of school and getting into the swing of activities, I've been rather MIA. But, since the middle of the summer I've had this post festering. Today I've finished the work El 3atal wanted me to take care of, dropped the kids at school and responded to e-mails. Finally (!) I have time to blog... I've been thinking an awful lot about how our parents teach us our outlook on life. We were talking about a cousin who recently moved to a new city. She moved away from home and family hoping to be happy. But, the reality that she has yet to learn (in her 40s) is that happiness isn't a place. Someone who is determined to be unhappy will be anywhere. Someone who is determined to be happy will be - anywhere. And, much of this approach to life is learned behavior. Let me give you an example. This cousin's sister was sitting with a relative one day bemoaning and "poor me'ing" about how hard her life is. She's 30 something and unmarried, she has had such a hard life, and so on. The relative said to her (slightly incredulous), what are you talking about? You are healthy, you own your own apartment in one of the world's best cities, you have a great job where you are appreciated, you make more than enough money to meet your needs. What in the WORLD do you have to feel sorry for yourself about? This cousin thought for a moment and realized, hey, you're right. I'm blessed. Just a couple of weeks ago, she was married to a lovely man who suits her to a T. Once her outlook changed, so could everything else. This attitude is a serious danger in Jordan. Palestinian mothers, reacting to their own sense of loss and extreme emotional distress over being forced from their homes at very young and impressionable ages have left their children with the idea that they are poor and put upon. I see this attitude among many of the wealthiest families in Jordan. You see wealthy people who hoard their money. They still retain the refugee mentality, even those who have lived in wealth their whole lives. The parents do this, typically, without even realizing it. No parent WANTS their child to be unhappy. But, it is hard not to do what we've learned. As this younger generation has children, they must begin to guard against taking this same approach and instilling this attitude of dissatisfaction and poverty (of spirit if not money) in their children. As you can imagine, we saw many meltdowns, tantrums, and cry-fests. And, as we saw them I noticed something. Most of the kids were well-behaved. Most of the parents were excited to be there. But most of the tantrum-throwers' parents seemed annoyed to be there. They were uninterested and inattentive. The correlation there isn't surprising. In addition, the parents' approach to the characters defined the kids' approach. The parents who were willing to look foolish and ran up to greet characters and made it seem like an adventure to wait in line had kids excited to take pictures. The ones who didn't had kids hiding behind their legs or whiny and fussy long before their turn came. However, the best example of this for me was the Electrical Light Parade. Each night at 9pm, there is a parade. Now, this parade is something else. Really it is. All of your favorite characters ride floats lit with thousands of rainbow light bulbs. These floats wiggle and jiggle, the lights are lit in patterns to amaze and delight. The Beans have a 7pm bed time. Yep, even in the summer. Even in Jordan (where it seems to me the average is 10pm). The Beans go to bed at 7. But, for the Electrical Light Parade, they stayed up. We were at the park from 9 am until 10:30 pm. It was their longest day ever and featured hours of walking and standing in lines in extreme heat. By the time the parade started, I expected them to be tired and whiny. We found a nice spot and sat toward the end of the parade route. The crowds were massive and we were very lucky to find a spot. So, we sat and waited... and waited... and waited. Because although it started at 9, it didn't make it to us until about 9:30. From the moment the lights went down until the moment they came back up after the parade, the whole area around us was silent. It was if these throngs of people had gone to sleep. Maybe some were overcome with awe, but the rest were comatose or something. But, the Beans and I, sitting by the roadside shouted and screamed and cheered at the top of our lungs. We whooped it up for every character that came by. Personally, I figured if we're tired, how much more tired must those poor characters be. They've been there all day in hot costumes (and this is June, now) from sun up past dun down. So, we gave it our all. The Beans were having a splendid time. And you know what? I didn't hear a single whine the whole night. But what I did see was characters blowing kisses to the Beans. Everyone stopped in front of us and waved. The lost boys from the Peter Pan float even psyched out El 3atal as he was putting them on film, nearly causing him to drop the camera. And, for each float that went by, we got one-on-one views and attention. Every character and every float stopped next to us, twirled their lights, and called out to us. After all, who better to acknowledge than the only people within 300 feet who are cheering? And, I'm sure the people around us thought we looked and sounded like idiots. We were crazy people. And I can't remember EVER having that much fun. Ever. Even after 13 hours of walking. Even after skipping dinner. Even standing in heat and humidity so oppressive it could have been a sauna, that was the most fun I've had in my life. And the Beans, they had a great time without whining or fussing. They were exhausted. They fell asleep in the car on the way home (and we were staying 5 minutes away). But they had a great time. Imagine with me, if you will, what would have happened had I been like all of the other zombies on the parade route. Would the Beans have had such a great time if we had sat as the parade went by and clapped indolently at them? Would they have such great memories if the characters hadn't blown them kisses and waved directly to them? I know they wouldn't have. And, had I not been willing to look crazy and childish, they would have missed that experience. My sincere hope is that it has taught them to being open to looking silly if it means having fun.